Jack Raymond Bedient, 60, died June 4, 1998. 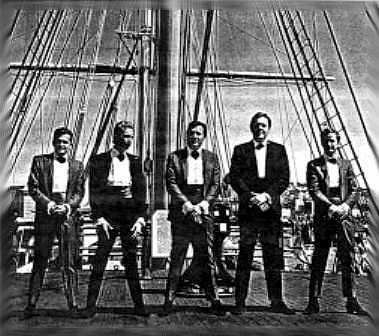 He was born Sept. 10, 1937, in Mason City, Wash. A longtime resident of Nevada, he was a headliner in Reno and Las Vegas showrooms with his group "Jack Bedient and the Chessmen." He is survived by his wife, Wylema; five daughters; 11 grandchildren; and one great-grandchild. Services were held. Cremation Society of South Bay in Redondo Beach, Calif., handled arrangements. I played drums for Jack Bedient and the Chessmen in the fall and winter of 1972. The group at that time was a trio consisting of Jack on guitar, Steve Eggleston (Stark Naked and The Car Thieves) and Sam Wisner on drums. This was in the waning days of the old Chessmen. I never got to meet any of the original side men but heard numerous stories of Kevin and Bill. Jack had two drummers on stage while working the upstairs lounge at Harold's in Reno. One was Jerry Bledsoe and the other was a guy named Ira but do not remember his last name. Jerry was a rocker and Ira was a country drummer. In those days you were one or the other. Also on board were Kevin, Bill and and organist named Walter Hanna. Bob Dee was still involved with Jack's bookings. This was the year that the gasoline shortages and price hikes began and the engagements were getting fewer and far between. My first gig with Jack was at Harold's club in the small bar on the second floor. We did two or three more in California and the band broke up just before New Years in 1972. I haven't seen or heard from Jack since and do not know what ever happened to him. I was the 1st and I think only organist for Jack Bedient and the Chessmen, added just before their first venture into the world of Nevada casino lounge and then headliner room bookings. They had some earlier 45's out and one album when I joined. I recorded on the later 45's and wrote a couple of songs that went on 'B' sides. We also had an album recorded "Live At Harvey's" casino at Lake Tahoe. This was in their new "go-go" room, all dance stuff, done by a on-site Sunset Sound recording crew from Los Angeles, released with Fantasy Records pre-Creedence, not to mention Sunset Sound pre-Electra records in Hollywood. I was "discovered" by the Chessmen playing in a pizza parlor in Redwood City, California on their night off - they had a gig down the road at a classy night club. I played organ and an early Wurlitzer electric piano with friends from 1st year of college. We were the house band for a couple of pitchers of free beer and pizzas plus $15 per man a night playing surf music and whatever else was on the Top-40 radio, Beach Boys, Buffalo Springfield, Ray Charles etc. This was around "spring break" 64-65 when I dropped out of Belmont Community College and split from friends and pizza gig to grab a lucrative job offer and regular gigs with Jack and the Chessmen, $300 a week to start - big money in those days and the end of my former every-day life. In Reno, some months after the first gig at the Golden Hotel, now Harrah's, we started getting airplay on recently recorded 45's and over about a year had 4 # 1 Top-40 hits. The line at the casino hotel was so long to get in for our shows, the tail of the line was near the start, going around the whole city block. It really was a mind-blower for hicks like us. In between some Nevada bookings we went to Sacramento to play a couple of weeks at one of the popular local nightclubs, following Question Mark and the Mysterians, with one of our 45's at # 16 on the local radio. I stayed with the band until sometime in '68. Bookings were getting worse. In Nevada the front line, which was Jack, Kevin, and Bill had plagiarized several very popular lounge acts' comedy bits and came up with some of their own which were pretty funny. This worked like a charm in Nevada, but everywhere else, dance music was wanted; later bookings into some dinner music type clubs didn't work out, but it was getting hard for the bands manager, Bob Dee in Reno, to keep full-time gig's coming. We use to go to the Golden in Reno to see the Chessmen play and enjoyed their music. The last time I saw Jack playing, was in Joe Conforti's "Cabin in the Sky" in Virginia City Nevada. He played solo. In 1968 Jack Bedient and the Chessman performed for a couple of weeks at the upscale Marine Room of the Olympic Hotel in Seattle. This was around the time of the Sky River Rock Festival. Jimi Hendricks did a concert on September 6th, 1968, at the Center Coliseum in Seattle. We stayed in the hotel as part of our contract and a couple of times I shared the elevator with Noel and Mitch but never saw Jimi. One night I was playing the organ during one of our shows and I looked over at the door and saw Hendricks standing there in what was probably a $1,000 red crushed-velvet jumpsuit. The maitre 'd shook his head no a couple of times and Hendricks left. I later asked the maitre 'd what had gone on. He said that Hendricks had wanted to come in but he told him since he wasn't wearing a shirt, tie and jacket he would not be admitted.